Tianmeng teaches many styles of Kung Fu such as Shaolin, Wing Chun, Qi Gong, Tai Chi, Meihua Quan, Bagua, Xingyi, and Baji. They are famous for their unique training in Meihua poles, which was previously a Chinese Kung Fu secret. Tianmeng also offers optional classes such as Mandarin, Chinese traditional medicine, Chinese culture, calligraphy, tea ceremony, as well as Buddhism and Taoism theory. When you arrive at the academy, you will be assigned a master according to what you want to learn. Your master will assess your abilities and create an individual training plan to suit your level, wants, and needs. 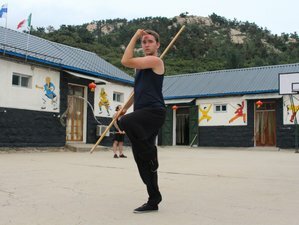 During this time, you can manage to get a general idea of what Chinese Kung Fu is like and learn the methods to practice some Chinese Kung Fu styles. This training will include basic knowledge of Chinese culture and Chinese Kung Fu. You will learn fundamental kicks, steps and sweeps, punches, palms, and hand shapes. Authentic health care Qigong, hard Qigong, low and high Meihua poles training, flexibility training, stability training, and endurance training will be part of the program. During this training, you will be served three hot meals per day, seven days a week. Vegetarian, vegan, and halal food will be catered for. On special occasions such as festivals and birthdays, the masters and students will eat together. The cook is very flexible and has lots of years of experience in cooking. The meals are carefully prepared, taking into consideration the need for energy and health maintenance while training in Kung Fu. The academy buys products locally and ensures that they are free of additives, enhancers, E-numbers, and pesticides. The academy prepares special meals for vegetarians and vegans. For students from Muslim countries, the academy gives special consideration as it is known how important it is for them to eat Halal.